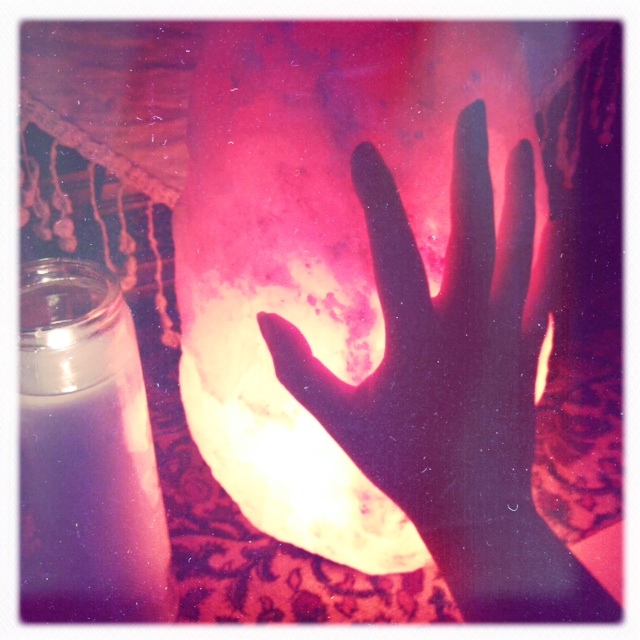 The night before the New Moon, I had time to do a simple and intimate New Moon Ceremony for myself. I just set up a special meditation spot in front of our non-working fireplace inspired by my meditation area post. it's a perfect spot for my huge salt lamp I just found. This space, especially bathed in the warm glow of the lamp, is so calming to me. It is exactly what I have been needing. I drew a card from my new Vision Quest deck and it couldn't be more poignant to me; Four of Earth - Security. And reversed. My issues with security tie heavily into financial matters, and my perception of family/marriage right now. They have been laying heavy on my heart. It's very clear I need make these shifts in my perception and what security actually means to me to move forward. It is such an uncomfortable topic for me to even think about. I need to address my budget. I need to acknowledge my vulnerability. I want to show myself compassion and allow myself to receive it. I then felt intuitively drawn to create a mini grid of black tourmaline. It's a very protective and grounding stone, and it felt so calming to me. It soothed my anxious soul. I hope your New Moon has been lovely. Mine was soft and quiet - just what I needed.